In 1798, many people in Ireland, strongly influenced by the ideals of liberty, equality, and fraternity exhibited in the French and American revolutions, decided to rise up against British rule. They formed the Society of United Irishmen, an oath-bound, non-sectarian, secret society dedicated to the overthrow of British rule in Ireland. Leading members included Theobald Wolfe Tone, and Lord Edward FitzGerald married to Pamela Simms, reputedly of Fogo, Newfoundland. Armed only with wooden staves topped with iron pikes against the more deadly British guns, the United Irishmen marched out to meet the British army. The United Irishmen were defeated but echoes of 1798 reverberated down through the next 200 years of Irish history. Today in Ireland, the United Irish Uprising is regarded as the first occasion in Irish history when Protestants and Catholics joined together in a common nationalist project. Outside Ireland, no Irish community other than Newfoundland had the social and demographic characteristics in which a similar rising might take place. In southeast Ireland, much of the action was concentrated in County Wexford, where some 5000 people lost their lives, and Wexford was a major source of Irish migrants to Newfoundland throughout the 1700s. By 1798, two-thirds of the population of St. John's was Irish, as were most of the soldiers in the British garrison stationed at Fort Townshend. The Waterford merchant Edmund Rice smuggled his wife's brother-in-law John Rice to Newfoundland in a barrel in order to escape retribution during the rebellion, and to this day in Placentia it remains oral tradition that Pierce Sweetman, the merchant of Placentia and New Bawn, County Wexford, plotted the rebellion in Ross in the parlour of his house at New Bawn. This painting of St. John's in the late 1700s shows Fort Townshend in the top centre. Artist unknown. Courtesy of Archives and Special Collections, Memorial University of Newfoundland, St. John's, and the Public Archives of Canada. In April 1800, rumours flew through St. John's that up to 400 men had taken the secret oath of the United Irishmen, including some soldiers stationed at Signal Hill, Fort William, and Fort Townshend. It is believed that some 80 or more soldiers planned to meet and mutiny at the powder shed behind Fort Townshend, which stood near what is now the juncture of Belvedere Street, Barnes Road, and Bonaventure Avenue. According to the British officers' reports, their plan, allegedly, was to kill their officers and the leading inhabitants in the town assembled for worship in the Church of England on Sunday, April 20th. The leaders' purpose, or what they hoped to achieve by their insurrection, has never been made clear. Whether they could even be proven definitively to be sworn United Irishmen is also unclear. Bishop O'Donel, who denied allegations that the Sunday plot included assassination at church, thought plunder and escape to America were the objectives. A much more likely explanation, suggested by others, was that the St. John's rising was less of a United Irish rebellion than it was simply an act of working class desperation to escape grim economic conditions and officer tyranny, which had required many of the Irish reserve soldiers to remain on duty instead of engaging in the fishery, by which they derived support for their families in St. John's. As things turned out, the garrison commander John Skerrett decided to place the entire regiment on parade that Sunday. Some soldiers involved in the plot, fearing discovery, panicked. On the following Thursday night, 19 soldiers took up arms and rendezvoused at the powder shed behind Fort Townshend, expecting to be joined by others. Soldiers from Fort William were unable to join them, however, because the commander there, Colonel Thomas Skinner, had scheduled a social function that night, detaining many of the men. Word of the mutiny spread quickly, the alarm was raised, and the deserting soldiers were pursued as they fled over the barrens and into the woods behind St. John's. Ten days later, on 30 April 1800, Skerrett wrote to the Duke of Kent, the commander-in-chief of the British forces at Halifax, that a Sergeant Kelly of the Fencibles on Signal Hill deserted with 12 rank and file, with six soldiers from the Royal Artillery at Fort Townshend. These 19 men took 23 stands of arms and ammunition and assembled at the powder shed at Fort Townshend, and had planned to meet 30 more conspirators composed of 25 members of the Fencibles and five artillery men, "all United men". But the 30 were stopped before they reached the powder house, three of the 19 were caught, while four others surrendered and 12 more took off to hide in the woods. Captain William Haly - for whom the modern St. John's golf course Bally Haly is named - a native of Cork and a veteran of the Fifth Regiment of the Irish Brigade, arrested one rebel on 29 April "concealed in the loft of the R.C. Chapel," and Skerrett reported that "There is another lurking in St. John's protected by his brethren United Fellows." Within several weeks, all of the 19 but two - Sergeant Kelly and James Murphy, the alleged ringleaders - were captured. Four of the mutineers who informed on the others were not tried by court martial. Of the remaining 13, five were hanged near the powder shed [see the Eastaff map], and eight were sent to Halifax to be dealt with by the Duke of Kent. 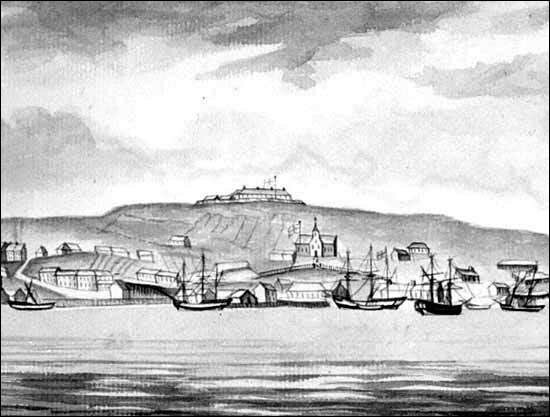 Within several more weeks of the mutiny, all the remaining soldiers of the St. John's garrison were transferred to Halifax, and replaced by Halifax soldiers. In Nova Scotia the eight convicts witnessed the executions of three more mutineers: Garrett Fitzgerald, Edward Power and James Ivory. The remaining five convicted soldiers were sentenced to transportation. Sixty-five years later, the historian Charles Pedley charged that Bishop O'Donel had intervened and prevented the successful implementation of the rebellion because he had "doubtless derived" his knowledge about the plot "from the confidential communications of the confessional" (Pedley 216). However, there was never any contemporary evidence of this, and no other historian ever made such claims. It is difficult to believe that O'Donel violated the seal of the confessional in order to betray his parishioners. The United Irish Rising in the St. John's garrison had several implications for the Irish in Newfoundland, and for British governance of its lucrative fishing colony. The Newfoundland rebellion was, as far as is known, the only one to occur which the British administration linked directly to the rebellion in Ireland. The uprising in St. John's was significant in that it was the first occasion on which the Irish in Newfoundland deliberately flouted the authority of the state, and because Britain feared that it might not be the last. It earned for Newfoundland, in the minds of British officials in the Colonial Office, a reputation as a "Transatlantic Tipperary", a far-flung but semi-Irish colony with the potential for political turbulence.